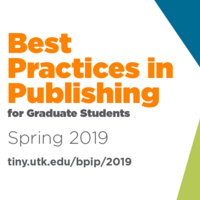 The Best Practices in Publishing program, sponsored through a partnership between the Graduate School and the UT Libraries, provides opportunities to discuss research and publishing-related issues with graduate students from across the university. Over seven sessions in the spring, a range of topics will be introduced and discussed with campus experts, including experienced faculty. Registration opens on January 7 at tiny.utk.edu/bpip/2019, and will stay open until all 40 available seats have been filled. All sessions will be on Tuesdays from 5:15 p.m.–6:45 p.m. Participants will be required to attend all sessions and submit reflections after each session. In addition, participants will be required to participate in discussions and question-and-answer sessions. An anonymous submission form will allow participants to submit questions of a sensitive nature ahead of time so speakers will be able to discuss real concerns. Upon successful completion of the program, you will receive a certificate acknowledging your participation in the program; this certificate should be a welcome addition to the dossier that you will need in applying for faculty positions and/or for retention/promotion.